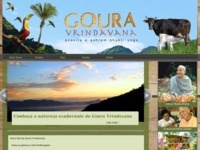 The official website of Goura Vrindavana Eco village located in Paraty, Rio de Janeiro, Brazil. The goal of Goura Vrindavana is to transform that piece of land into a wildlife sanctuary as well as a spiritual sanctuary. The idea is to build a model radiating transducer and a sustainable community, environmental, charitable and God-conscious. Category Farm Communities April 27, 2012 by ISKCON Desire Tree.